and landscape environments to fit your needs. Welcome to Unique Landscapes by Griffin, Inc. & Unique Custom Pools, LLC. Unique Companies specialize in all aspects of landscaping, pool construction and swimming pool remodeling. Unique Companies build everything from swimming pools to complete backyard environments, allowing you to enjoy ‘Outdoor Living’ in Arizona to the fullest! Unique specializes in some of the best construction techniques for building a new pool in Arizona. As a custom swimming pool builder, all of our new swimming pools carry warranties that are some of the best among Phoenix pool builders. Whether you are using the spa for pure leisure enjoyment or for physical therapy , whether you have a pool you want to add a spa to or you just want a free standing spa, Unique has the expertise you need. Our landscape division can handle all aspects of outdoor living, with both Arizona landscape & general contracting licenses. We can design & install most anything you can imagine for your Arizona backyard outdoor oasis. Unique Landscapes by Griffin, Inc. & Unique Custom Pools, LLC. 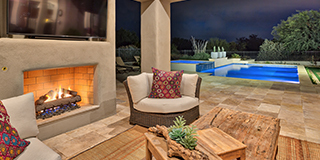 can handle all aspects of Arizona outdoor construction and remodeling; from Phoenix swimming pools to Arizona landscaping & backyard environments. With pool, landscape & general contracting licenses, we can design & install anything you can imagine for your outdoor oasis. Please contact us to start your project today! Copyright © 2016 Unique Landscapes by Griffin, All right reserved.